I intentionally made the skirt just a little on the long side (just like the inspiration), but I kept the insets in the corner "pleats" just-to-the-floor length so they wouldn't bunch up when they hit the floor. 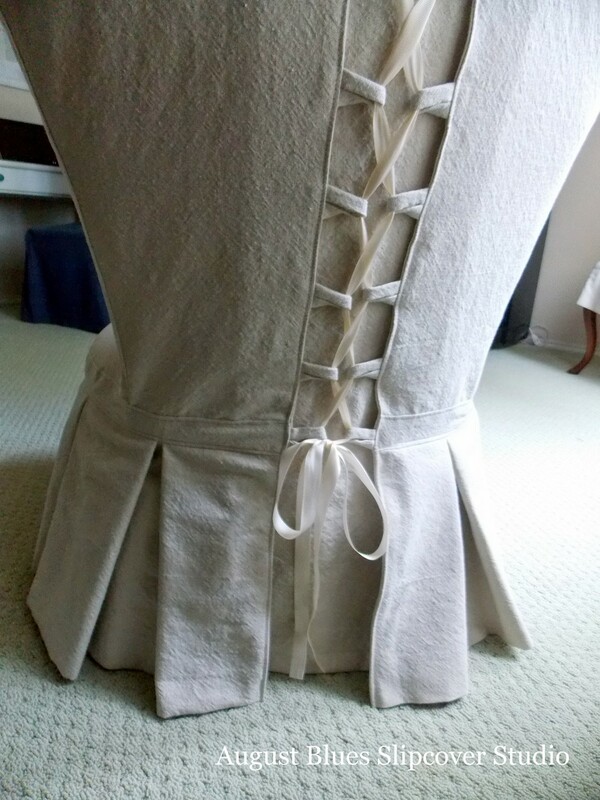 I was able to incorporate several original dropcloth seams in the top and in a couple of the side panels (first time to do that, and I think it makes for a fun detail!). It all adds up to a new look for a favorite piece! Have you tried something new lately? ... a well-loved couch, sturdy, but in need of an update. As with any renovation project, we started with the structure, before we did the cover. The couch sat quite low to the ground, so, based on the starting seat height, we determined that the width of a 2x4 would be enough to raise the seat height to a standard 18". My client's father built three frames of 2x4s to raise the couch . Unfortunately, I didn't get a picture, but there was one for each end, and one for the middle that the frame of the couch rested on. It made a big difference, both in appearance and function! A completely new look! 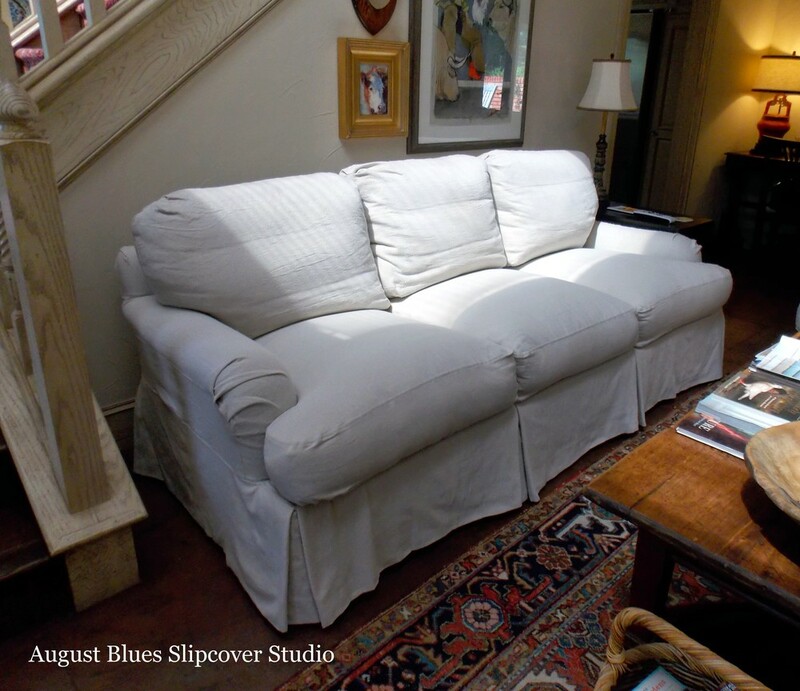 The other "structural" change was the addition of new custom inserts for the back cushions. We increased the size slightly over what we started with and filled them with cluster polyfill for resilience. 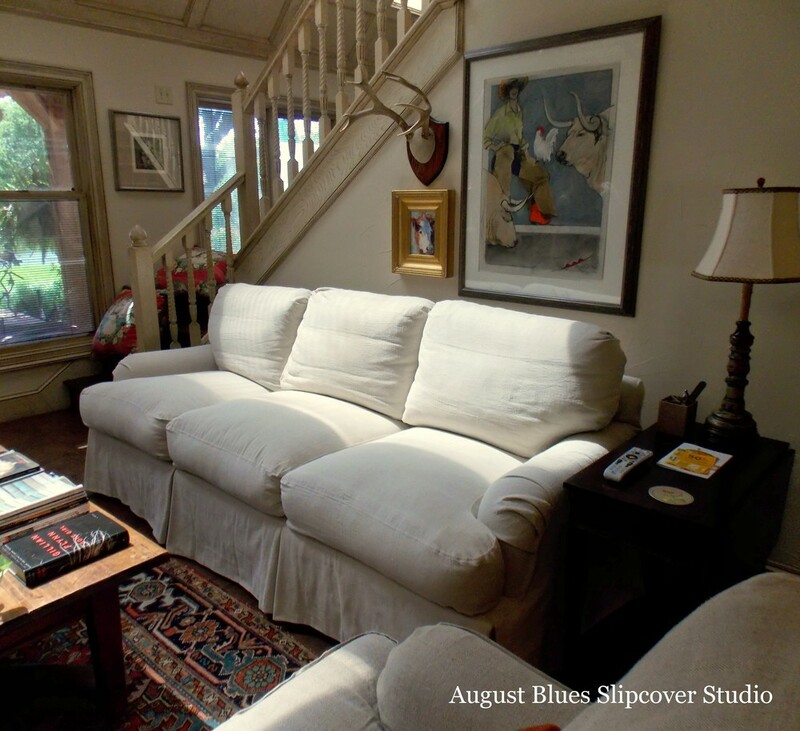 The smaller, rectangular cushions (not pictured here) were also replaced with new down inserts. Just piping trim and a simple, tailored skirt (with a corner pleat that didn't get pressed quite right :/). I thought the corner of our front room (my office/furniture holding room) needed a little something, a chair specifically. I like wing chairs for the height they bring to a seating arrangement, so I went to Craigslist to see what I could find. 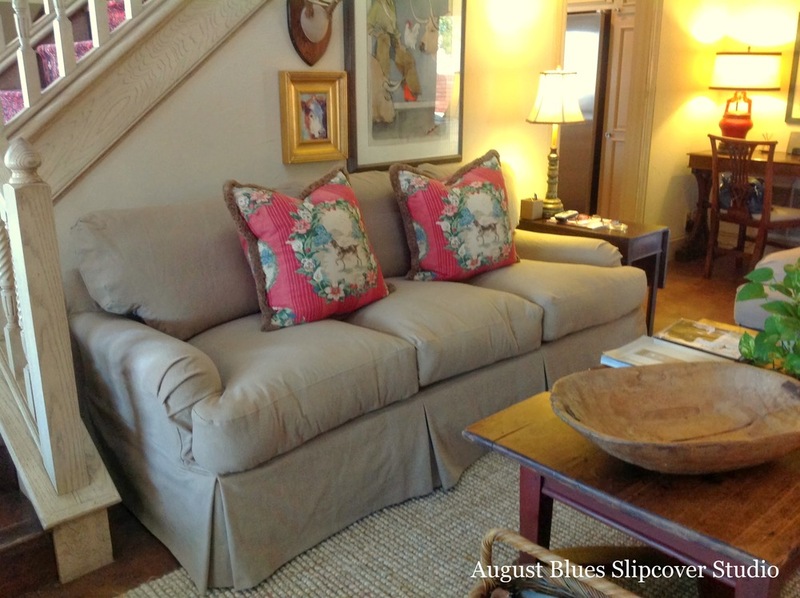 I didn't want to spend a lot of money on a chair whose primary job was to fill a space and look good (with a slipcover, of course), so when I spotted one nearby for $5, I contacted the seller about details and we went to have a look. Whew, much better, even if it is actually as off kilter as it looks in the picture! It now blends perfectly with the rest of the bedroom decor and is beautifully serving it's purpose. ...I'm going to go with the Nester, who says "it doesn't have to be perfect to be beautiful." Can I get an "Amen!" to that? Sometimes the right thing comes along at the right time, even if it wasn't quite what you originally had in mind. Such was the case for my client with this pair of vintage chairs. In perfect shape and at a great price, they filled the need for a couple of chairs for a sitting area. 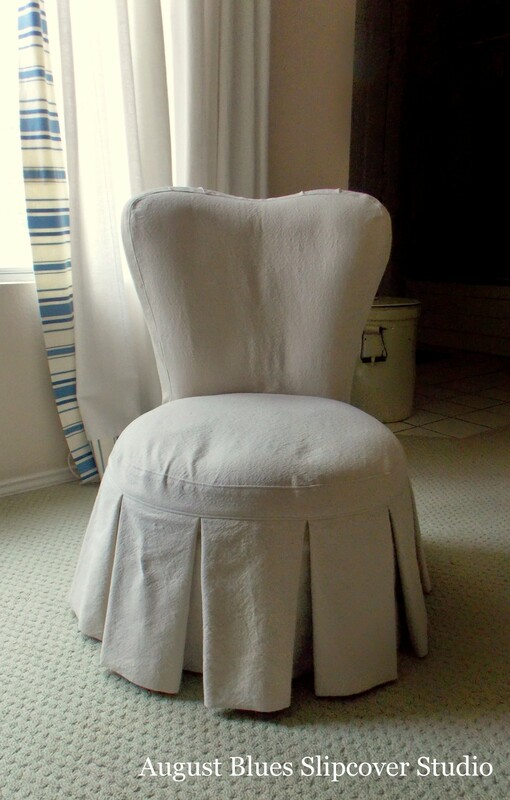 No piping, and a waterfall skirt give this chair contemporary, clean lines. I wrapped the existing foam cushions in new batting and gave them an underslip before putting them in their new covers. To manage the curve of the front and back, I followed the original seam lines with my fabric panels. And now this pair has a new lease on life! Have you found anything vintage for your home lately? I made a pocket for 1/2" foam to be inserted in the seat area (the foam can be pulled out so the rest of the cover can be washed). The ruffled skirt attached to the back part of the seat with tabs and velcro. Grosgrain ribbon joined the ends of the skirt. The gathers and pleats were such simple, but pretty details! The red upholstery was not original ;) But, it wouldn't work well under the lighter colored linen, so we decided to take it off and I did a not-fancy upholstery job with a couple of layers of dropcloth to give us a neutral base to start. No, I am not going into the upholstery business! Sweet and simple. The cover was shaped around the posts and closed with the mis-matched buttons and tabs. The bottom edge was finished with a simple blind hem. My client also requested a bevy of throw pillows for the loveseat and other places around the room. She included a solid, rustic linen for this part of the project. Time to play! The largest pillows (20") were done in the solid linen, with a zebra flange and french pleats at the corners. The 18" pillows were done in the zebra, with looped button closure using mother-of-pearl buttons I had on hand. 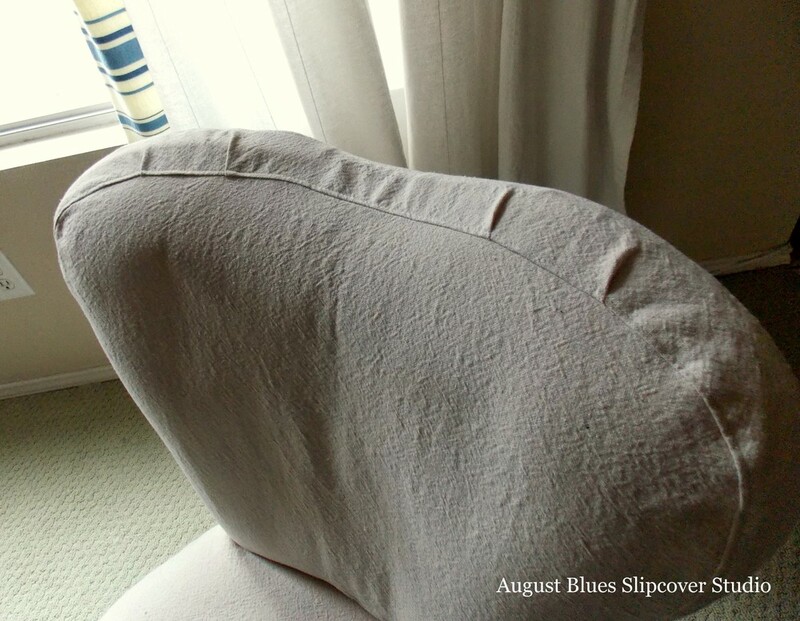 Yes, that is a functional closure (one of my pet peeves is pillows with buttons that don't work - weird, I know ;) ). The lumbar pillows were done in the solid linen, with a center panel of pin-tucks and more zebra flange. Just an fyi - the down pillow inserts came from Cutting Corners. They have stores in Dallas and Fort Worth (and a few other cities), but we weren't making a trip there, so I took advantage of their FREE shipping (and they have a Design Pro discount if you are in the design business). The inserts got to me within a couple of days and worked great (no, I don't get any compensation for this - they just give great service!). And, yes, order them 2" bigger than the intended size of your covers - it really makes a for a nice, plump pillow. Do you use animal prints in your home? Lighter and brighter! My client chose 8oz dropcloth from Sherwin Williams; they washed up beautifully soft, but seemed to have more variation in texture than the Lowes ones I have used more often. We did a tall skirt again, and top-stitched the seams. From the front - soft and inviting. And look at that gorgeous dough bowl! My client has a great eye for mixing antique and vintage pieces in a way that is fresh and comfortable. 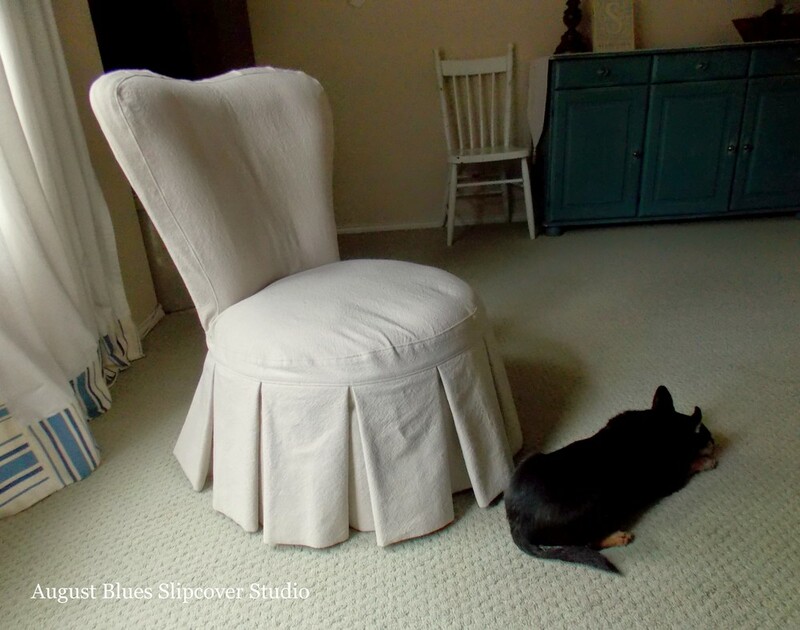 Have you done any projects with dropcloth lately? I think she was waiting for me to put HER chair back in it's spot! Have you made anything with dropcloth?